The leader of the Anglican Church in Wales, Archbishop Barry Morgan, has hit out at plans to upgrade the UK's Trident nuclear missile system. Dr Morgan said the £25bn costs could prevent 16,000 children dying each day from diseases caused by contaminated water and malnutrition. The comments were contained in a speech to the church's governing body. Tony Blair has said a decision on the missile system's future will be made by the end of the year. The 280-strong governing body made up of members representing all six dioceses of the Church in Wales, meets twice a year. 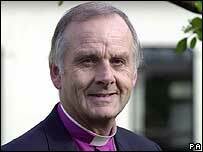 Details of the archbishop's speech were released ahead of the two-day gathering at the University of Wales, Lampeter. The body will debate the issue on Thursday. The archbishop stressed the views on the nuclear deterrent represent his own personal opinions and not those of the church he leads. "I would like to express my own concern about the government's apparent commitment to a long-term replacement for the Trident weapons system," he said. "With that kind of money we could prevent 16,000 children dying every day from diseases caused by impure water and malnutrition. "The deaths of 16,000 children a day is the equivalent of 40 jumbo jets crashing every day of every week. "Our world would not tolerate that - just look at what happens when our airports grind to a halt. "But we do tolerate hunger, poverty and impure water, and are prepared to contemplate spending our resources on weapons of mass destruction." The archbishop went on to argue against renewal. He said Trident is an "anomaly" in the post-Cold War era when the UK no longer is faced with a direct nuclear threat. He contended that under the Nuclear Non-Proliferation Treaty, the UK should not replace Trident but take a "leading role" towards nuclear disarmament. "I do not see how we can say to Iran that it ought not to have nuclear weapons whilst at the same time replacing ours," the archbishop said. "£25bn is an enormous sum of money"